A handsome herbaceous plant of fens and lakeshores, especially frequent in the Fermanagh lakeland, around Lough Neagh and the Lecale lakes. Plants are of two kinds, referred to as separate botanical varieties: var. radiata has ray-florets around the edge of the flower-head, var. cernua lacks these and produces only disk-florets. Var. cernua is the commoner and more widespread plant whereas var. radiata is characteristic of the Lough Neagh shores and lakes in Co. Down, but is rare elsewhere. 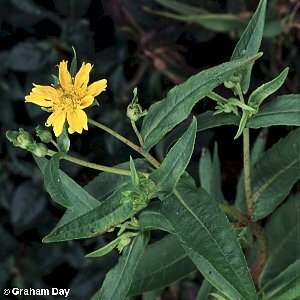 The leaves are undivided - a feature which separates this species from the otherwise similar trifid bur-marigold (Bidens tripartita). All names: Bidens cernua L.